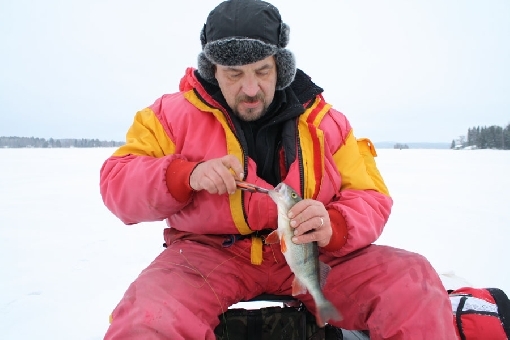 Because of rather high temperatures in December, anglers had to wait for long time the beginning of the ice fishing season in Southern Finland. After two weeks period of low temperatures (in many areas temperature has dropped below - 20 degrees Celcius) all lakes also in southern part of the country have now ice cover and ice anglers are drilling holes with their ice augers. Thickness of ice on lakes is generally 20−30 cm. On the coast and archipelago the situation varies more but also coastal waters of Baltic Sea are freezing little by little. During next weeks ice will get thicker and thicker, because there is only little snow or no snow at all on the ice. Weather forecast don´t show any real snow fall in next week, but quite low temperatures will continue. Unlike last winters, moving is now easy and enjoyable on the ice. It is time to drill the first hole of the season!